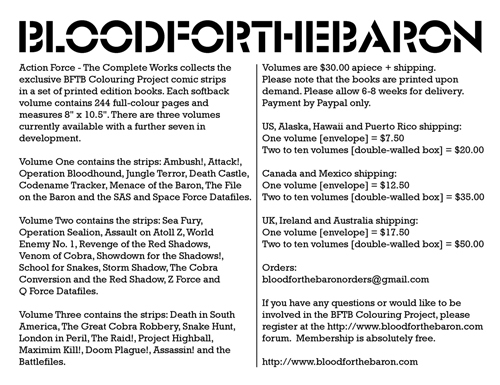 Colouring Project and Red Dawn available at Joecon!- BLOOD FOR THE BARON!!! Huge thanks to Antarctica for flying the BFTB colours at Joecon! Check out the Yojoe frontpage for details. I have designed an exclusive BFTB postcard for the event. how can i get a few?? that looks cracking! Tremendous job. Go to Joecon! There's only 200 printed. Great achievement getting a mention at the Joecon and books sold and finally we can get some sense of accomplishment. 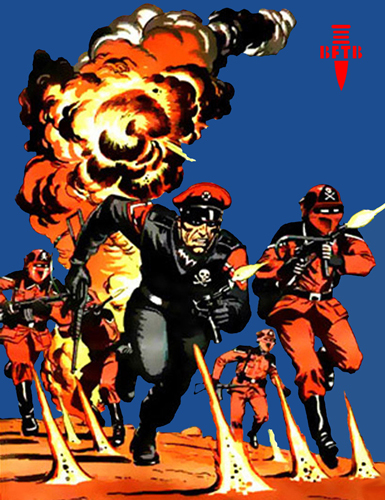 Yeah, it's a relatively unknown piece - I took it from the bottom left corner of the four-part Baron Ironblood poster. Any chance of seeing the whole picture? The part you posted looks good. it's in the archive. comics/posters section; fourth one. Red Laser wrote: Great achievement getting a mention at the Joecon and books sold and finally we can get some sense of accomplishment. BLOOD FOR THE MO FOOKIN BARON!